Kala and Keira, the two dogs whose heartbreaking hug made headlines over the summer, finally got their happy ending this week. And it's all thanks to the power of social media. 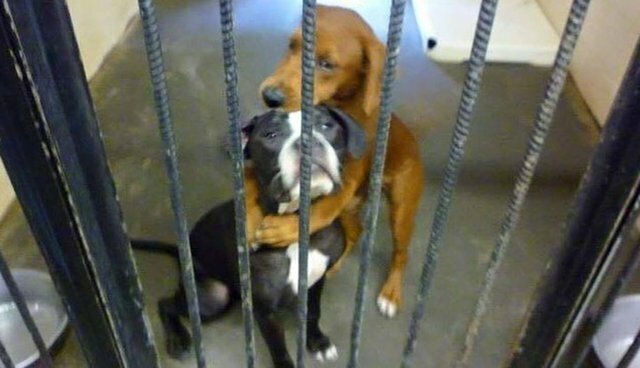 A shelter volunteer with Angels Among Us Pet Rescue snapped this photo of the two pups, scared and alone in a county shelter in Georgia back in July. The pups were at risk of being euthanized if they didn't find a home quickly. Kala had tenderly wrapped her paws around her best friend, just as though she was trying to comfort her. The photo was shared thousands of times on Facebook, and the two gals found an emergency foster home the next day. Their lives were saved, but they still didn't have a permanent place to rest their heads. Just this week though, Angels Among Us shared the happy news that Kala and Keira had finally found their forever home - and their new moms couldn't be more perfect for them. The two doggie best friends found new homes with two human best friends, Wendy and Pam, who also happen to be roommates. Now Kala and Keira can stay together and keep on looking after each other. But they never have to be scared for their lives again.